Recorded in Luke 2:29-32, Simeon's song is the final (fourth) "great" canticle in Luke 1-2.This song of joy and peace is part of the gospel account of the presentation of Jesus in the temple, involving first Simeon and then Anna (w. 21-40), who express thanks that salvation in Christ is for Jew and Gentile alike. Simeon's song is often called the Nunc Dimittis, after its incipit in Latin. Dewey Westra (PHH 98) versified the text in Detroit in 1931 for the 1934 Psalter Hymnal; it was revised slightly for the 1987 edition. The Nunc Dimittis has traditionally been paired with the Magnificat for Vespers or evening services and is still sung daily in churches with a tradition of daily prayer services (see 247 for more information on this tradition). John Calvin used it at the end of the Lord's Supper. In the Scottish Kirk, if communion was served at both services, Psalm 103 would be used at the end of the morning Lord's Supper and the Song of Simeon at the end of the afternoon or evening Lord's Supper. To leave the security of worship and enter the world for service requires firm confidence in the faithful promises of God to be with us, to care for us and bless us. Our deepest assurance comes from the comfort we have that “I am not my own, but belong—body and soul, in life and in death—to my faithful Savior Jesus Christ” (Heidelberg Catechism, Lord’s Day 1, Question and Answer 1). Because I belong to him, “he will provide whatever I need for body and soul, and will turn to my good whatever adversity he sends upon me in this sad world. God is able to do this because he is almighty God and desires to do this because he is a faithful Father” (Heidelberg Catechism, Lord’s Day 9, Question and Answer 26). We have the assurance that “our Lord speaks to us now through the inspired Scriptures. Christ is with us day by day” (Our Song of Hope, Stanza 1). How rich it is to carry such assurance of his blessing with us as we leave the service of worship! because I love you. Amen. Great God, you spoke of the coming Messiah through the prophets. In the fullness of time you sent your beloved Son. Now let us depart in peace. My eyes have seen your wonderful salvation. Amen. Recorded in Luke 2:29-32, Simeon's song is the final (fourth) "great" canticle in Luke 1-2. This song of joy and peace is part of the gospel account of the presentation of Jesus in the temple, involving first Simeon and then Anna (w. 21-40), who express thanks that salvation in Christ is for Jew and Gentile alike. Simeon's song is often called the Nunc Dimittis, after its incipit in Latin. Dewey Westra versified the text in Detroit in 1931 for the 1934 Psalter Hymnal; it was revised slightly for the 1987 edition. 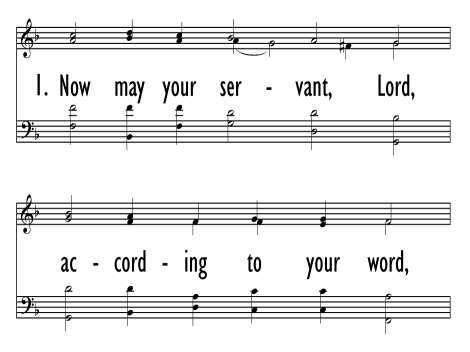 The Nunc Dimittis has traditionally been paired with the Magnificat for Vespers or evening services and is still sung daily in churches with a tradition of daily prayer services. John Calvin used it at the end of the Lord's Supper. In the Scottish Kirk, if communion was served at both services, Psalm 103 would be used at the end of the morning Lord's Supper and the Song of Simeon at the end of the afternoon or evening Lord's Supper. Louis Bourgeois composed NUNC DIMITTIS for the Song of Simeon; the tune was first published in the 1547 edition of the Genevan Psalter. Claude Goudimel wrote the harmonization in 1564 with the melody originally in the tenor voice. Some Christian traditions associate this tune with the ancient Greek "Candlelight Hymn," which begins with the words "O gladsome Light, O grace" in the translation by Matthew Bridges. Dewey D. Westra (b. Holland, MI, 1899; d. Wyoming, MI, 1979) was a dedicated educator, writer, and musician who faithfully served the Christian Reformed Church. He attended Calvin College, Grand Rapids, Michigan, and Wayne State University in Detroit. In the 1920s and 30s he was a Christian school Principal in Byron Center and Detroit, Michigan. During the 1940s he was involved in various ventures, including becoming a diesel instructor for the Ford Motor Company. After 1947 he became a principal again, serving at Christian schools in Sioux Center, Iowa; Randolph, Wisconsin; and Walker, Michigan. Westra wrote poetry in English, Dutch, and Frisian, and translated poetry into English from Dutch and Frisian. He arranged many songs and composed songs for children's choirs. He also versified all one hundred and fifty psalms and the Lord's Prayer, as well as the songs of Mary, Zechariah, and Simeon, in meters that fit the corresponding Genevan psalm tunes. His manuscripts are housed in the library of Calvin College. 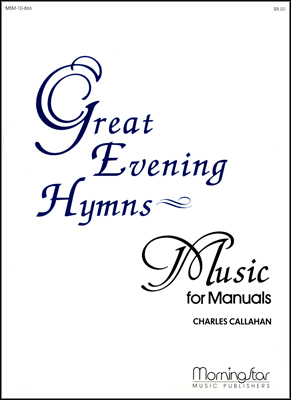 Seventeen of his psalm versifications and his paraphrases of the Lucan canticles were included in the 1934 and in the 1959 editions of the Psalter Hymnal. Much of the credit for keeping the Genevan psalms alive in the Christian Reformed Church goes to Westra. Louis Bourgeois (b. Paris, France, c. 1510; d. Paris, 1561), in both his early and later years, wrote French songs to entertain the rich, but in the history of church music he is known especially for his contribution to the Genevan Psalter. Apparently moving to Geneva in 1541, the same year John Calvin returned to Geneva from Strasbourg, Bourgeois served as cantor and master of the choristers at both St. Pierre and St. Gervais, which is to say he was music director there under the pastoral leadership of Calvin. Bourgeois used the choristers to teach the new psalm tunes to the congregation. The extent of Bourgeois's involvement in the Genevan Psalter is a matter of scholar­ly debate. 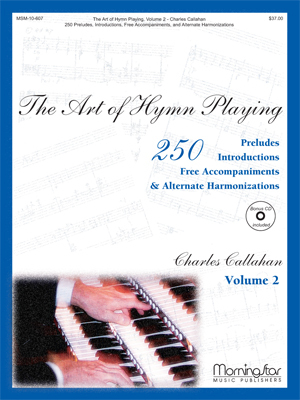 Calvin had published several partial psalters, including one in Strasbourg in 1539 and another in Geneva in 1542, with melodies by unknown composers. In 1551 another French psalter appeared in Geneva, Eighty-three Psalms of David, with texts by Marot and de Beze, and with most of the melodies by Bourgeois, who supplied thirty­ four original tunes and thirty-six revisions of older tunes. This edition was republished repeatedly, and later Bourgeois's tunes were incorporated into the complete Genevan Psalter (1562). However, his revision of some older tunes was not uniformly appreciat­ed by those who were familiar with the original versions; he was actually imprisoned overnight for some of his musical arrangements but freed after Calvin's intervention. In addition to his contribution to the 1551 Psalter, Bourgeois produced a four-part harmonization of fifty psalms, published in Lyons (1547, enlarged 1554), and wrote a textbook on singing and sight-reading, La Droit Chemin de Musique (1550). He left Geneva in 1552 and lived in Lyons and Paris for the remainder of his life. The music of Claude Goudimel (b. Besançon, France, c. 1505; d. Lyons, France, 1572) was first published in Paris, and by 1551 he was composing harmonizations for some Genevan psalm tunes-initially for use by both Roman Catholics and Protestants. He became a Calvinist in 1557 while living in the Huguenot community in Metz. When the complete Genevan Psalter with its unison melodies was published in 1562, Goudimel began to compose various polyphonic settings of all the Genevan tunes. He actually composed three complete harmonizations of the Genevan Psalter, usually with the tune in the tenor part: simple hymn-style settings (1564), slightly more complicated harmonizations (1565), and quite elaborate, motet-like settings (1565-1566). The various Goudimel settings became popular throughout Calvinist Europe, both for domestic singing and later for use as organ harmonizations in church. Goudimel was one of the victims of the St. Bartholomew's Day massacre of Huguenots, which oc­curred throughout France.